Since the very first Cracker Barrel Old Country Store® opened back in 1969 in Lebanon, Tennessee, we've prided ourselves on keeping things pretty simple. The way we see it, our mission is to please people. Simple as that. We try to greet everyone who walks in our front doors with a warm welcome and serve good meals at fair prices. Whether you’re stopping in for our homestyle cooking or stopping by to browse our country store, we want everyone to be treated fairly and with respect. We figure if we take care of our guests, well, then, the business will take care of itself. And fortunately, so far, it has. Gift mom some beautiful home decor from Cracker Barrel this Mother's Day! 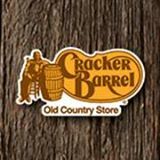 Both my mother and my mother in law love Cracker Barrel both for their food and their wonderful little gift shop. Did you know you can also shop their store online? I just recently learned I could and let me tell you if I'm ever in need of a gift for my mom or mother in law I now know right where to go for a gift. 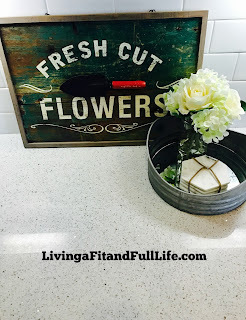 Cracker Barrel's Fresh Cut Flowers" Wall Decor is beautiful and goes with just about any decor. It features distressed wood and an antique-look garden trowel and vintage style letters for a stylish, collected look. Cracker Barrel's Fresh Cut Flowers" Wall Decor is perfect for Mother's Day! Cracker Barrel's Faux Hydrangea and Rose Decor brightens any room! I absolutely love how realistic the white flowers and "water" appear. It's the perfect way to get that fresh-from-the-garden look year round. I also love that it goes with just about any home decor! Cracker Barrel's Faux Hydrangea and Rose Decor makes a wonderful gift this Mother's Day! Marble Coasters - Set Of 4 from Cracker Barrel is the perfect way to protect your furniture from drips and rings! I love the beautiful white marble that goes with any home decor. Cracker Barrel's Marble Coasters would make a terrific gift this Mother's Day that's sure to impress mom! 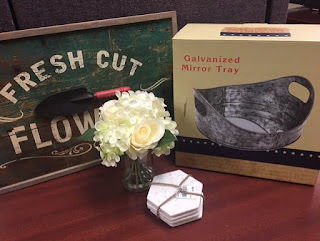 Cracker Barrel's Galvanized Mirror Tray is so popular that it's already sold out online. It's stunningly beautiful and goes with just about any home decor. Whether you set it on the counter or hang in on the wall it's sure to bring a warm farmhouse feel to any room. Celebrate mom this Mother's Day with a gift from Cracker Barrel that's sure to please!